When it comes to protecting the environment and the public from the risks of crude oil transport along the Hudson, we mean business. 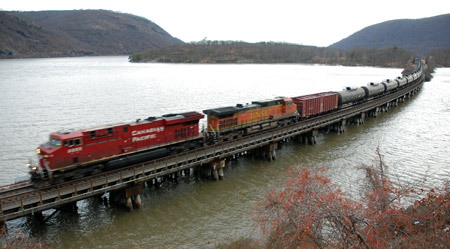 That’s why Riverkeeper, along with four other environmental and community organizations, filed suit against the New York Department of Environmental Conservation June 9. Riverkeeper and Waterkeeper Alliance, represented by Pace Environmental Litigation Clinic, and our co-petitioners, represented by Earthjustice, are seeking to ensure a full environmental review of Global Companies‘ proposed expansion of crude oil operations in Albany, which would enable the vessel loading and transport of heavy, “tar sands” crude, which sinks and would be nearly impossible to recover if spilled into the Hudson. The DEC must meet its legal obligations and require a full study of the impacts—including the risk of a catastrophic spill. Wigwam has been planning several posts about energy and the local economy. Between the situation in Iraq and the Middle East and the pushback on trains carrying crude oil from the Bakken fields in North Dakota, it looks like now would be a good time to roll those out. Stay tuned!